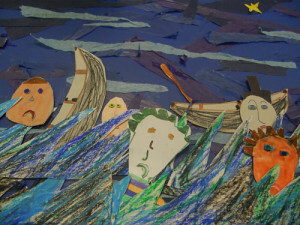 The Magic of Water – and other sculpture, carnival and animation group projects. 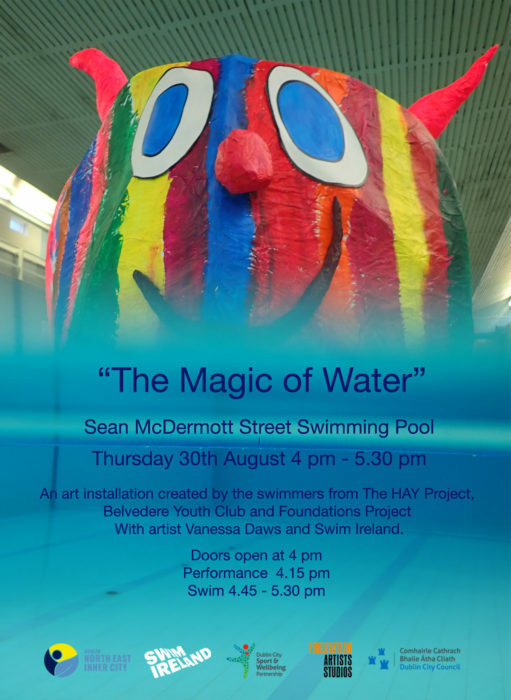 The Magic of Water is an art installation celebrating swimming created by the swimmers from Sheriff Street ASESP, Foundations Project, Belvedere Youth Club and The HAY Project with artist Vanessa Daws. The Magic of Water is set in a mythical waterscape based on the legend of Hy-Brasil a phantom island that appears every 7 years in the Atlantic Ocean off the west coat of Ireland and then mysteriously disappears again. The groups drew ideas of what this island could look like and who would live on it and in the surrounding waters. 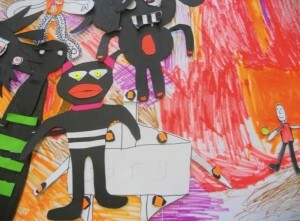 The groups made large scale sculptures from a selection of their drawings. 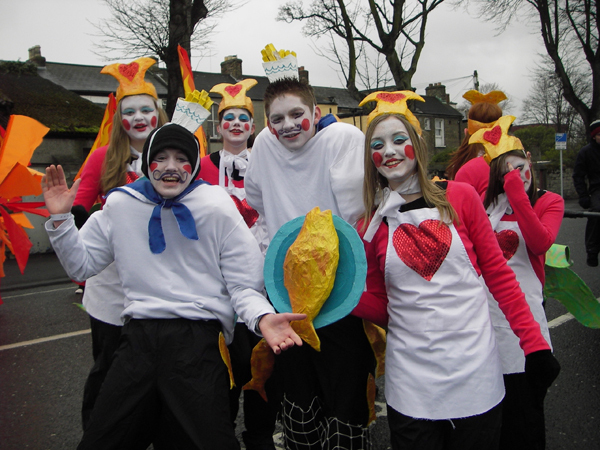 This fantasy waterscape was brought to life with a performance from the groups choreographed by synchronised swimmer coach Aoife Drumm. This sound piece was created using a hydrophone. The groups recorded sounds below the water in the pool, they also interviewed each other and talked about why they enjoy swimming. 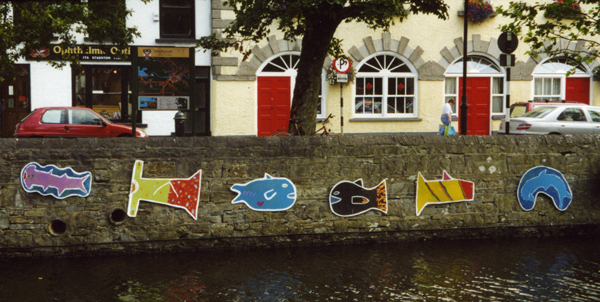 The work was made from these recordings, as well as an interview with Terry Fagan a local historian and a keen Liffey swimmer while growing up in Dublin 1. A slide show of images from the Magic of Water II 2019. 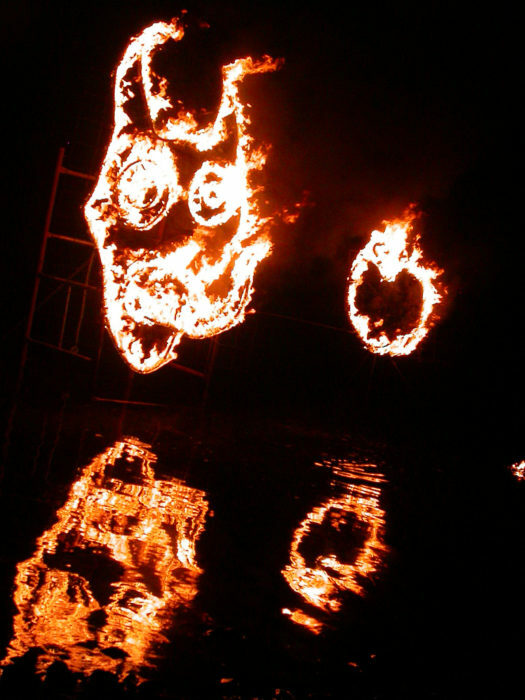 A slideshow of images from the 1st performance of The Magic of Water in 2018. Below are the 2 posters from the 2018 and 2019 Magic of Water events. 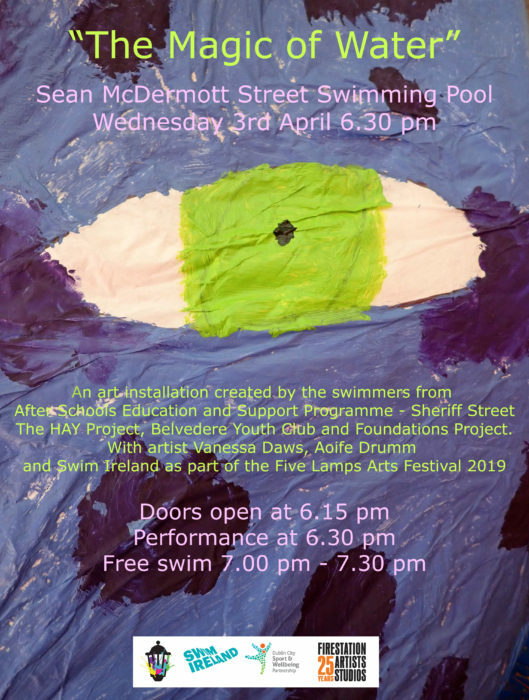 With help and support from: Carol Finlay, Swim Ireland, Sean Mc Dermott Street Swimming Pool, Ger Carty, Aoife Drumm, Terry Fagan and Fire Station Artists’ Studios. 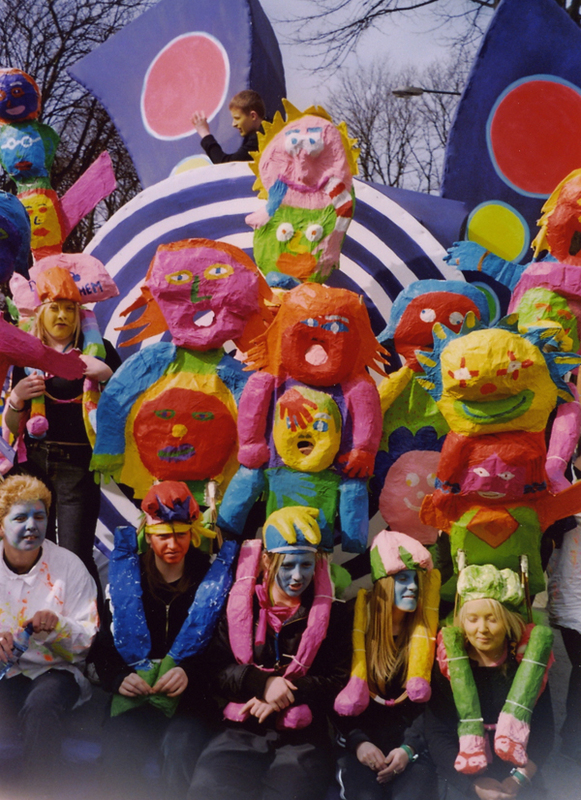 I’ve been working in carnival, spectacle and community arts since graduating with Fine Art in the early 90’s. 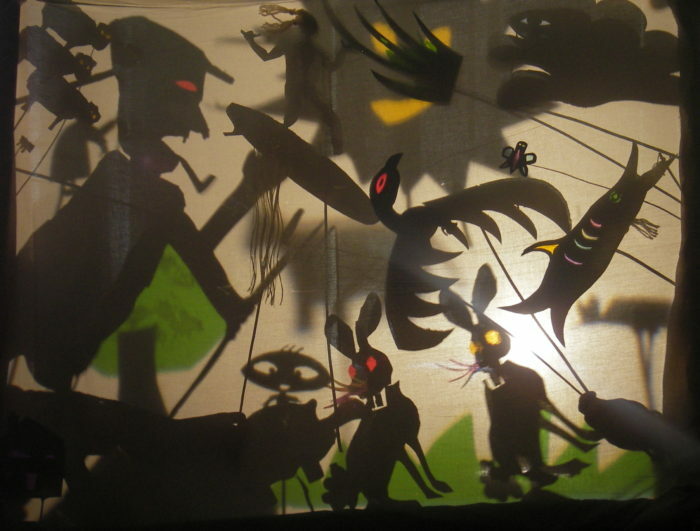 I facilitate art workshops in many mediums – sculpture, stop motion animation, sound, image making, shadow puppets. Visual Research + Exploration Module at the Athlone Institute of Technology with the 1st Year Graphic Design students 2018 . The Transition Year class from Ringsend College made this video as part of their exploration of the River Liffey just outside the school. The students used a Gopro camera and a hydrophone, which is an under water microphone to explore both above and below the Liffey. 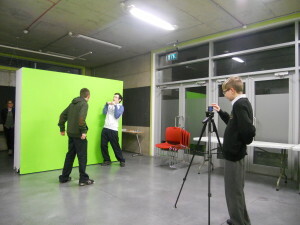 The video and sound workshop was part of “Art Avenues” arts education programme supported by the RHA and Mason Hayes and Curran. The film was selected as a finalist in the The Fresh Film Festival National Awards 2017. Thanks to Jean Mann, Margaret Beausang and St Patrick’s Rowing Club. ALIGHT! 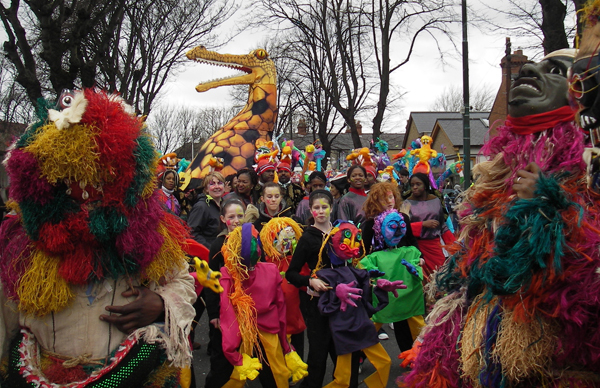 was part of Dublin City Culture Connects 2016 – The National Neighbourhood Project in the South East Area, Dublin with Cois Céim Dance Outreach. 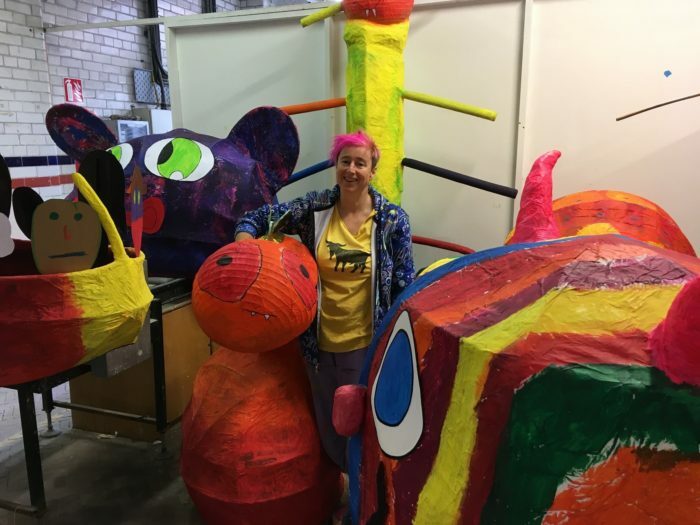 I was asked to work with local community groups in Ringsend, Irishtown and Sandymount to collaboratively design and decorate a double decker bus that would be a stage and centre piece for a series of cabarets, art workshops and trips to galleries, museums and the seaside in the south east area. 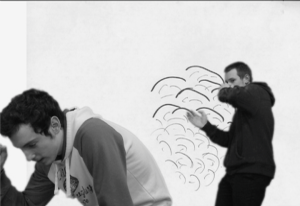 Muirne Bloomer was the director of the project and we worked together with performer and facilitator Hugh Brown. Cleo Fagan managed the project and Jenny Brady filmed the ALIGHT! 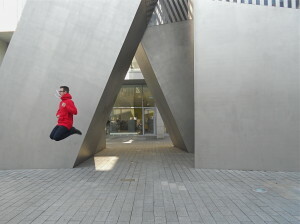 project and worked on the Talk to Youth photography workshop. 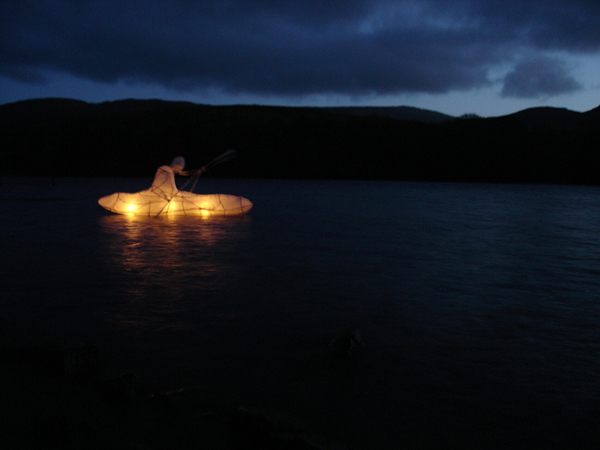 The theme for the project was Light and the art, dance and performance workshops explored ideas of journeys and navigation. The outside of the bus was decorated with drawings from St Patrick’s Girls and Boys National School on their take on Brent Geese that stop off in Dublin bay every year. They also preformed a movement piece with Muirne Bloomer and Hugh Brown . 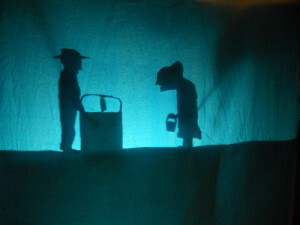 The inside of the bus included a shadow animation made by Ricci’s Cafe, a light piece, video work and photographic images created by the Talk about Youth group. There were many layers, different activities and groups involved in this project, below is a slide show from some of the workshops and performances. Below is a link to a PDF of a book of Brent Geese drawings by St Patrick’s National School and a book of photography made by the Talk about Youth group as part of the ALIGHT Bus project in 2016. 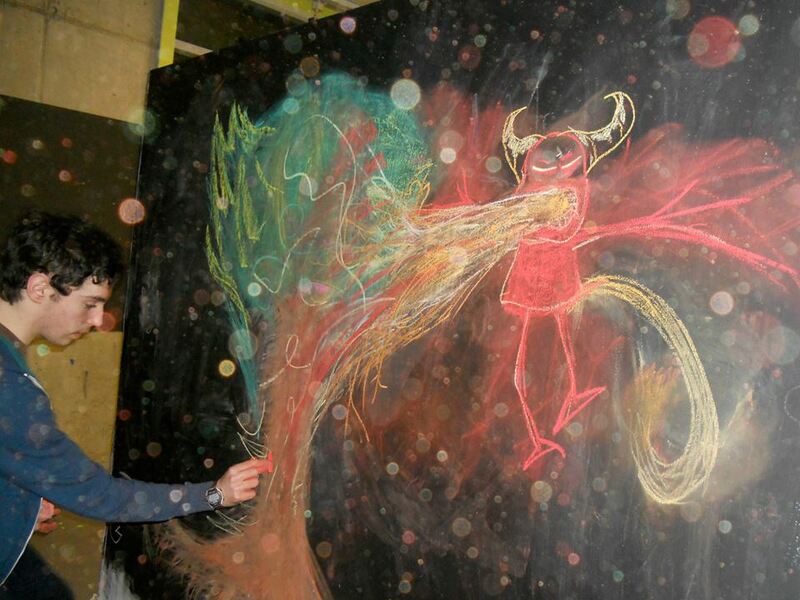 I was asked to facilitate art workshops for the Dockers and Demons Halloween festival. 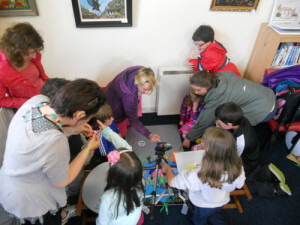 There was an art exhibition in the Ringsend Hall of all the art works including a shadow puppet stop motion animation from St Patricks National School. There was also a Halloween parade and street party on a very rainy Halloween night. The project was supported by Dublin City Council and I worked along with Muirne Bloomer the artistic director and performer Hugh Brown on the project with St Patricks Girls and Boys National School, 6th year students from Ringsend Tech, Riccis Cafe,The GALS, Ringsend After Schools Club and the Girl Guides to create this work over a month before Halloween. A slide show from the workshops. 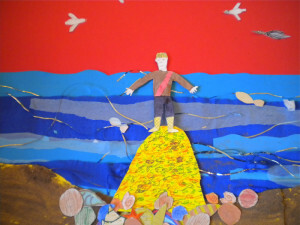 Below are a selection from some stop motion animation workshops throughout the years. All the animations can be found on my Vanessa Daws animation Vimeo page. 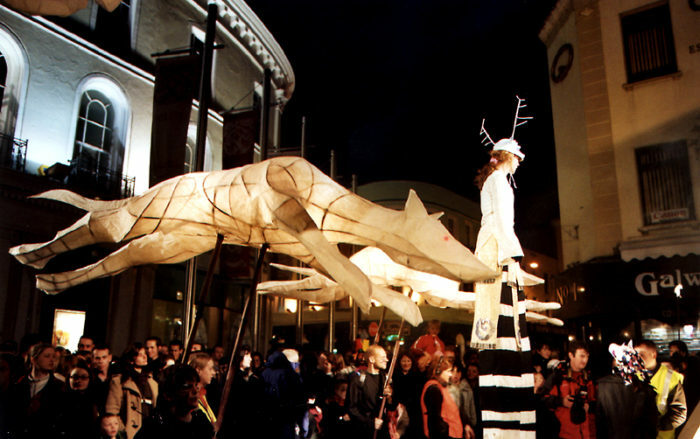 Below are some images from community art events, events and spectacles from 2003 – 2007. 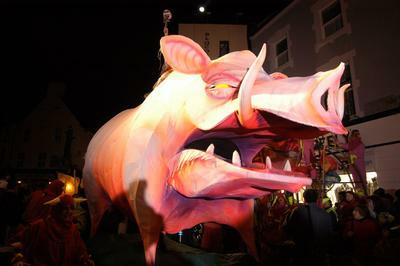 I designed the Macnas first Halloween Street Celebration 2003 and the Macnas summer parade ‘Betty Big Shoes’ as part of the Galway Arts Festival in 2004. 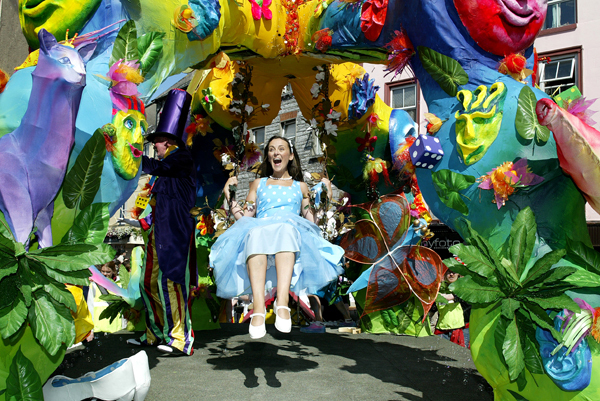 I then worked as Designer with St Patrick’s Festival, Dublin with ‘Brighter Futures’ 2005/06 and ‘City Fusion’ 2007. 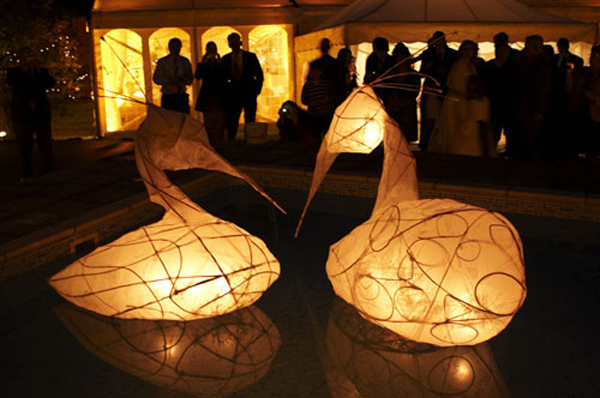 There are also some images from the Abhainn Rí Festival, Callan, Co Kilkenny, Westport Arts Festival and examples of lantern sculptures and fire drawings.